They perch like birds, but look as people. They speak with their eyes: He raped me and suffocated me until I died I put my hands up and he shot me eight times she locked me in the shed and starved me to death while I listened to my babies playing with her in the yard they came in my cell in the middle of the night and they hung me they found I could read and they dragged me out to the barn and gouged my eyes before they beat me still I was sick and he said I was an abomination and Jesus say suffer little children so let her go and he put me under the water and I couldn’t breathe." Jesmyn Ward is the winner of two National Book Awards for Fiction: Salvage the Bones (2011, also reviewed here) and Sing, Unburied, Sing (2017). This latest novel is a heart-wrenching story that starts in a bad place, takes us steadily to darker places, and then ends in a kind a truce with death. 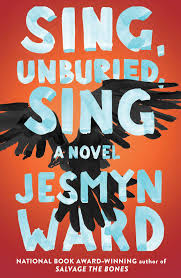 "Sing, Unburied, Sing" gets good marks not for its tragic story but for its lyrical writing. It tells the story of JoJo, an African-American boy in Mississippi, his toddler sister Kayla, their parents, Leonie (who lacks the mothering instinct) and white father Michael (who is in prison upstate when the novel opens), and their grandparents, Pop (the patriarch who holds the family together) and Mam (the matriarch who is dying of cancer). And, oh yeah, there are ghosts. Mississippi's ghosts are never exorcised, it seems. I'm not going to say Jesmyn Ward has inherited William Faulkner's mantle (well, maybe I am), but Faulkner's quote is apt: "The past is never dead. It's not even past." The things the family members deal with are told powerfully, but beautifully. There is parental neglect, prison violence, police violence, drug addiction, cancer, racism, and children forced to grow up too soon. Much of it is told in the boy JoJo's voice. There's no way I can sugar coat this. It's a searing tale. But it's beautiful, too. Read it.